German Biblical critic and Semitist; born at Hameln May 17, 1844; educated in theology and Semitics at Göttingen (Ph.D. 1870), where he became privat-docent in the theological faculty in 1870. Two years later he was called as professor to the theological faculty of Greifswald, and in 1874 received the degree of D.D. "honoris causa" from Göttingen. He was compelled to resign from the theological faculty, however, in 1882 in consequence of his views on the Bible, whereupon he entered the philosophical faculty of Halle as assistant professor of Semitics. Three years later he went as professor of Semitics to Marburg, and was called to Göttingen in 1892. Wellhausen has written extensively on subjects of vital interest to the student of the Bible and of Judaism and other religions. Among his earliest publications was a dissertation on the tribal organization of ancient Israel ("De Gentibus et Familiis Judæis Quæ I Chron. ii. 4 Enumerantur," Göttingen, 1870). This was followed by a work on the text of Samuel (ib. 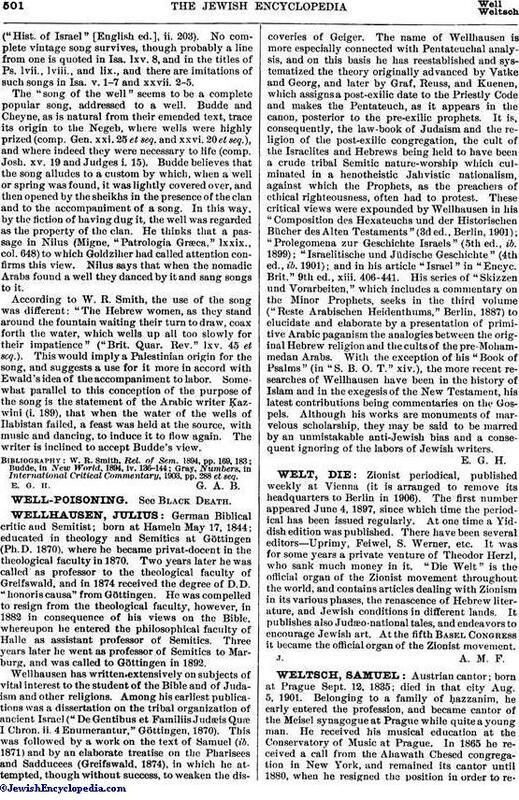 1871) and by an elaborate treatise on the Pharisees and Sadducees (Greifswald, 1874), in which he attempted, though without success, to weaken the discoveries of Geiger. The name of Wellhausen is more especially connected with Pentateuchal analysis, and on this basis he has reestablished and systematized the theory originally advanced by Vatke and Georg, and later by Graf, Reuss, and Kuenen, which assigns a post-exilic date to the Priestly Code and makes the Pentateuch, as it appears in the canon, posterior to the pre-exilic prophets. It is, consequently, the law-book of Judaism and the religion of the post-exilic congregation, the cult of the Israelites and Hebrews being held to have been a crude tribal Semitic nature-worship which culminated in a henotheistic Jahvistic nationalism, against which the Prophets, as the preachers of ethical righteousness, often had to protest. These critical views were expounded by Wellhausen in his "Composition des Hexateuchs und der Historischen Bücher des Alten Testaments" (3d ed., Berlin, 1901); "Prolegomena zur Geschichte Israels" (5th ed., ib. 1899); "Israelitische und Jüdische Geschichte" (4th ed., ib. 1901); and in his article "Israel" in "Encyc. Brit." 9th ed., xiii. 406-441. His series of "Skizzen und Vorarbeiten," which includes a commentary on the Minor Prophets, seeks in the third volume ("Reste Arabischen Heidenthums," Berlin, 1887) to elucidate and elaborate by a presentation of primitive Arabic paganism the analogies between the original Hebrew religion and the cults of the pre-Mohammedan Arabs. With the exception of his "Book of Psalms" (in "S. B. O. T." xiv. ), the more recent researches of Wellhausen have been in the history of Islam and in the exegesis of the New Testament, his latest contributions being commentaries on the Gospels. Although his works are monuments of marvelous scholarship, they may be said to be marred by an unmistakable anti-Jewish bias and a consequent ignoring of the labors of Jewish writers.